HJC Design Blog: Tuesday: By Dylan N.
Special thanks to Jared L. who pointed out to me that the blog was down. Thanks buddy, I didn't notice! Three more sleeps! I'm sure most of you think I'm referring to the NHL Draft. Well, that's slightly the case. I'm more excited about getting out of my regular life for a week and chilling at Myrtle Beach. I don't even have much planned for the short week vacation. Probably just sitting at the beach, reading Bob McKenzie's "Hockey Confidential" book (No we did not get paid to promote it). Probably some other things. I'd like to take a swing at golf. I'm horrible, but it's nice to get a round in now and then. I don't think I'll enjoy fishing as much but getting on a boat for awhile could be relaxing. As a kid when we would go on these vacations I was so excited to go around, wait in lines to see things that were over hyped. Now I'm just excited to just relax and get away from my everyday life for a little bit. Thanks to my aunts and uncles for taking my cousins and I to a vacation every summer, it's pretty awesome. I wouldn't have experienced so many things without them. So it's always nice the week before we leave to just get ready and plan out the stay. BUT THE DRAFT, I'M SO PUMPED. Now, as of right now the blog is having some technical difficulties. Hopefully that's sorted out soon. So whether you're on the regular website or the design blog, let's get to the concepts! 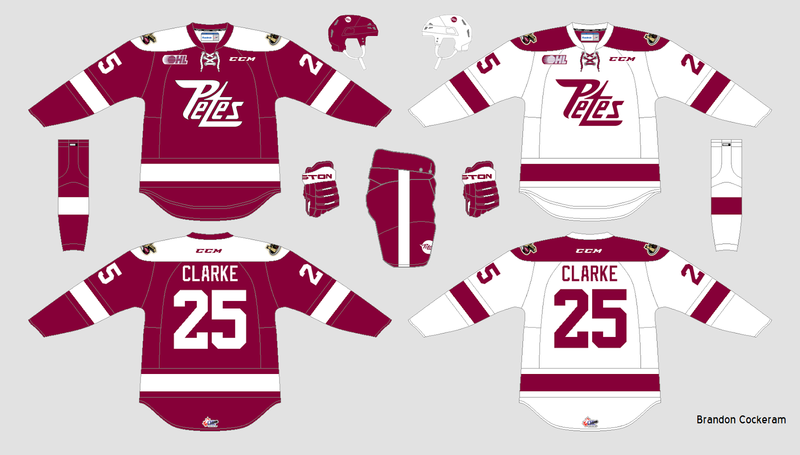 Peterborough Petes Concept - Brandon C.
Can't go wrong with a classic Petes concept. 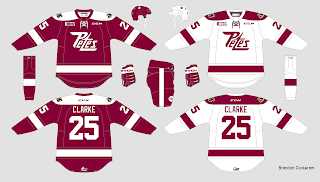 I don't think I've ever seen a Petes concept that wasn't a classic look. Is that even possible? I'd like to throw out a challenge. Make a Petes concept but really go out of the box. That's the easy part, the hard part will be making it look good. Go minions! Back to this concept though - I would like to see the Petes rock this look. Their current looks is okay. If they went to this though it would be awesome. Sure you'd get your folks that say it's nothing special and to be honest, it isn't but that's what makes it a good look. I especially like the white yokes. I would like to see those more often. Nice look, nice concept, nice execution. This is the women's hockey team, correct? I actually just went to look the league up and it looks like their draft was three days ago. 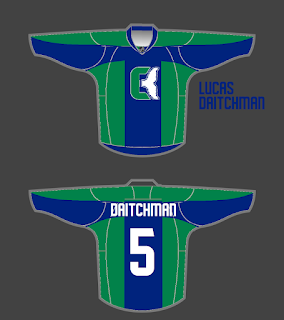 I couldn't find any jerseys or anything for any team so I'll just rate this as their unveiling. Execution notes. NHL badge should go, the front view of the jersey has yellow on the inside when their shouldn't be, a gray gradient on the inside of the collar. As for the design, I'm going to have to say 'meh'. The logo, which is no fault to Lucas isn't anything to ride home about. Next, to me the yellow black color scheme is much better with a more prominent black in it. HOWEVER, this time around, being a women's team I'll side with Lucas here. Giving a lighter scheme is a good idea. Having a bold name and number (TV numbers should be included) being black I would like to see the very very thin black stripes to be thicker and bolder. Making that change makes this look a lot better believe it or not. To me atleast. Lucas goes from classic to crazy real quick. This is a different design. I assume Lucas was going for a Colorado Avalanche look with the panels but it just doesn't look it here. The side panels come out way too far. For example if you had a double digit number It would cross over to the green and just look bad. Also you'll give the logo more breathing space. So I would make the side panels a lot thinner. Maybe even adding a white outline or a white design in their somewhere. It's a two color jersey with just white thrown in. 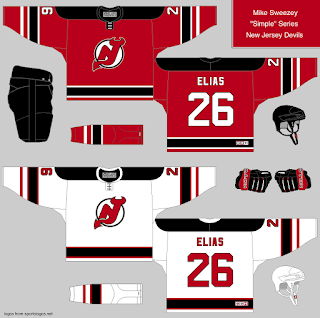 So I would make white a more dominant secondary color. Especially with blue and green, that color scheme is awesome. The last things I'll say will be execution. The template stitching doesn't fit the design given to it. No TV numbers. NHL badge on the collar. Keep on keeping on. 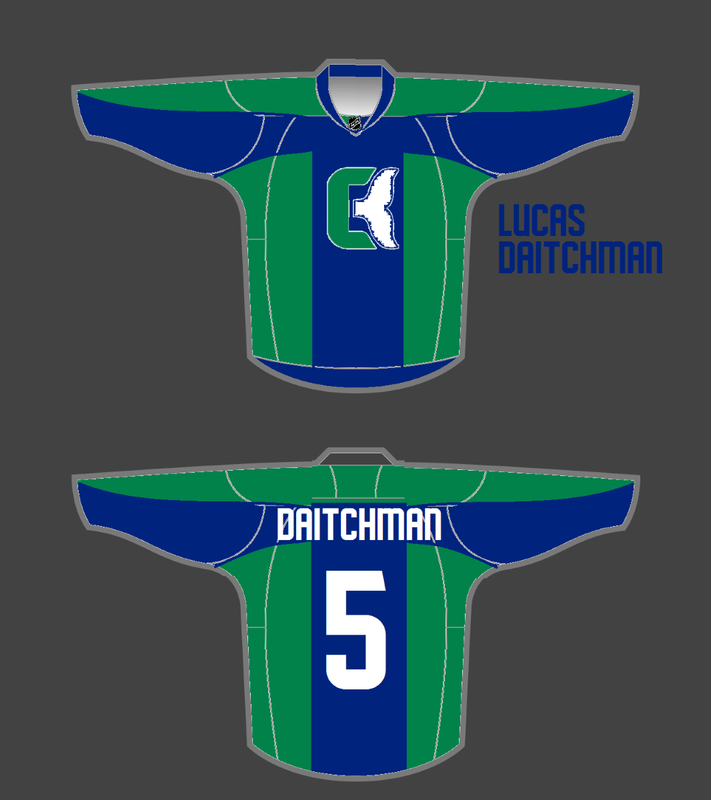 I can tell you'll make some amazing jerseys not too far into the future. 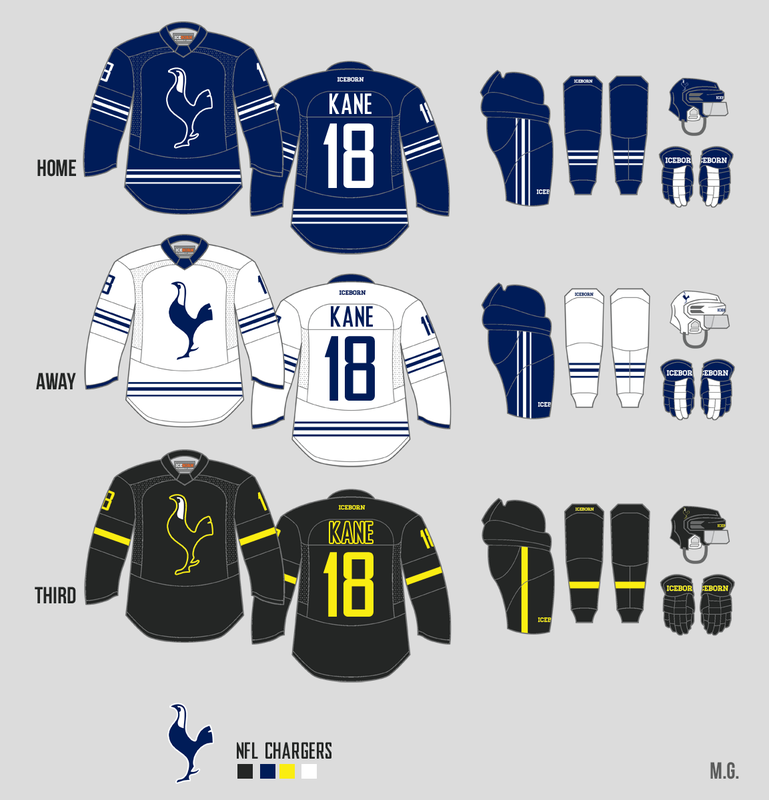 Tottenham Concept - Matt G.
From womens hockey we go to the futbol pitch. Interesting design elements here. I like the design all around on the home and road and third. I just wish the striping was bold. I say it time and time again and it might sound like a broken record but the slim striping that is thin to me doesn't look very good. I like stripes better when they are bold and can be identified quickly. 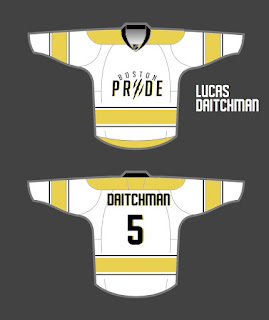 I'll make an exception on the third jersey because that yellow stripe is a nice small element. It's so minimal that I like it. Just make those changes to the home and road and this is a very nice look. 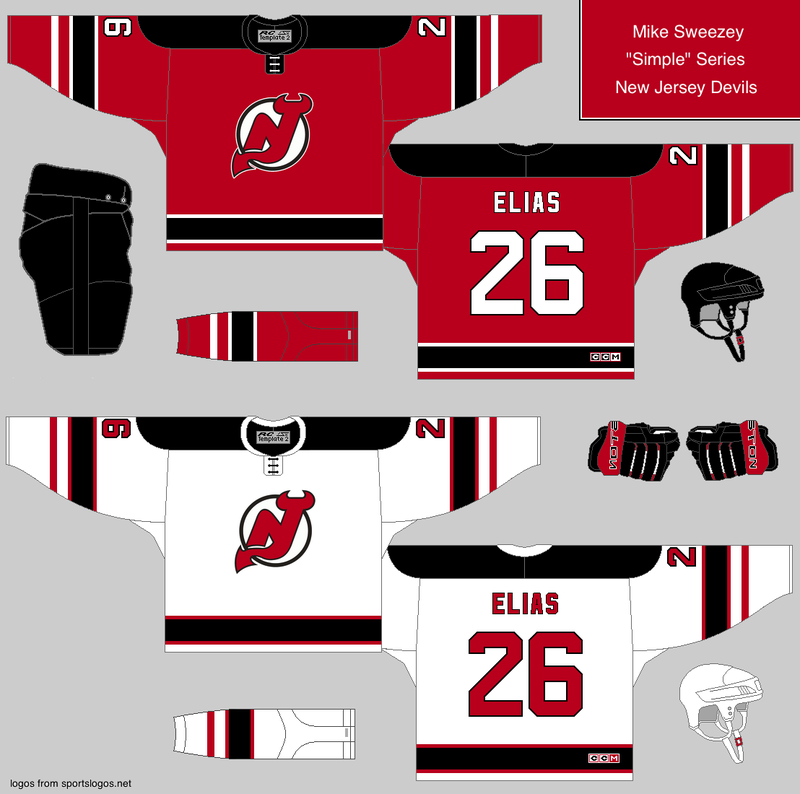 New Jersey Devils - Mike S.
Mike's simple series continues. Continues on to New Jersey. 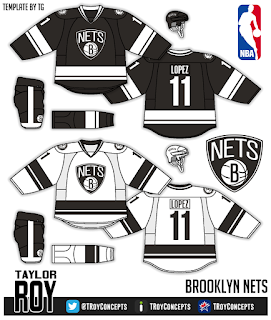 Everything here seems very similar to New Jerseys current look, just with the retro arm stripes in, and a rounded yoke. To be honest the rounded yoke is a backtrack. The hem striping being so low is also a little downgrade. The small sliver of jersey hem at the bottom seems useless. One other thing I'll make a comment on is the away collar. I think the black yoke going to a white collar is just offsetting. I'd leave that black like the home jersey. Overall I'd say this is a downgrade from their current look. Not too much but I think progress could be made. Now we ship off to the NBA to finish off this weird day at HJC. T-Roy as I will now call him from this point on gives two simple looks to two teams that need simple looks. I really like the logo choice used here. Only thing I would like to see in my mind would be a gold accent color. I know I know they don't have that on their uniforms but I would totally make that change here. It's great on it's own but I think a small gold touch could make this awesome! I'm giving my COTW nod to the Boston Celtics Concept today by none other than T-Roy. T-Roy came out on all cylinders tonight and really took his momentum home. T-Roy is just one of those players you don't find very often. A generational type designer if I do say so myself. Not a surprise here he gets nominated. Back to Bob McKenzie with his further analysis! Have a fantastic Tuesday everyone! I plan to post next week even though I'm in Myrtle. Hopefully this makes up for a couple late posts in the past. Woops. lol my friends actually call me T-Roy. 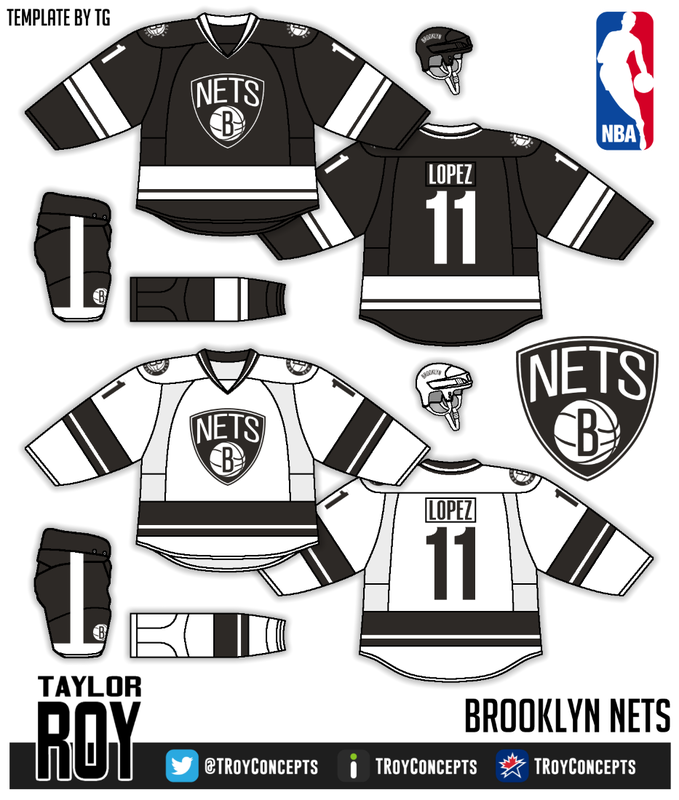 Anyway, my goal for the NBA series was to mimic the NBA jerseys the best I could which is the reason for the lack of gold. I do admit it that it would look much better with some gold though.